As Banks Cut Lifeline, Will Remittance Alternatives Emerge? As this decision gradually goes into effect over the next few months, affected small- and medium-sized money transfer businesses may be forced to shut their doors, lay off staff members, and sever essential remittance lifelines to countries from Nigeria and Somalia to Sri Lanka and Poland. What are the implications of this decision across the broader remittance industry, and how might innovative solutions emerge to fill the resultant gap? While Barclays is at the center of this current controversy, it is not the only major financial institution to shift away from providing accounts to international money transfer businesses. In fact, Barclays was one of the last remaining British banks willing to provide these services. The move, thus, is perhaps indicative of a broader, sector-wide problem. Facing hefty Anti-Money Laundering/Combating the Financing of Terrorism (AML/CFT) fines from US regulators, banks such as Barclays and HSBC are veering away from the international money transfer space. Last year, HSBC was forced into a US $1.9 billion settlement by US regulators over allegedly poor money-laundering standards. Following the settlement, HSBC decided to exit the money services business and close all associated bank accounts, leaving money transfer companies with only 30 days to find a new banking provider. According to Dominic Thorncroft, Chairman of the UK Money Transmitters Association (UKMTA), in a recent interview, there is no evidence that the affected money transfer businesses do not comply with AML/CFT or other regulations. However, this fact has not stopped regulators from increasingly fining banks associated with these entities – forcing banks to withdraw account services in order to avoid fines. Putting the reasons behind the Barclays decision aside, one thing is clear: the move will have a dramatic impact on both money transfer businesses and the recipients of remittances, many of whom are dependent on this money as their primary source of livelihood. Somalia will be particularly hard hit. Remittances comprise over half of Somalia’s gross national income, with more than US $1.2 billion remitted to the Somali territories annually. British-Somalis alone send up to US $154 million (100 million pounds) each year, making up 60 percent of the annual income of their families back home. Dahabshiil, the largest money transfer business in the Horn of Africa, is one of the companies that will be directly impacted by the decision. According to CEO Abdirashid Duale, cutting off accounts to the company and other money transfer agencies will be a “recipe for disaster.” His company alone has nearly 300 branches and thousands of agents across the Somali territories, providing an essential influx of money that is primarily spent on food, medicine and school fees. In Bangladesh, which received nearly US $1 billion in remittances from the UK last year, the impact of the Barclays decision could be similarly severe. According to Kamru Miash, managing director of KMB Enterprise Money Transfer Ltd., about 80 to 90 percent of remittances from the UK to Bangladesh go through Barclays’ accounts. 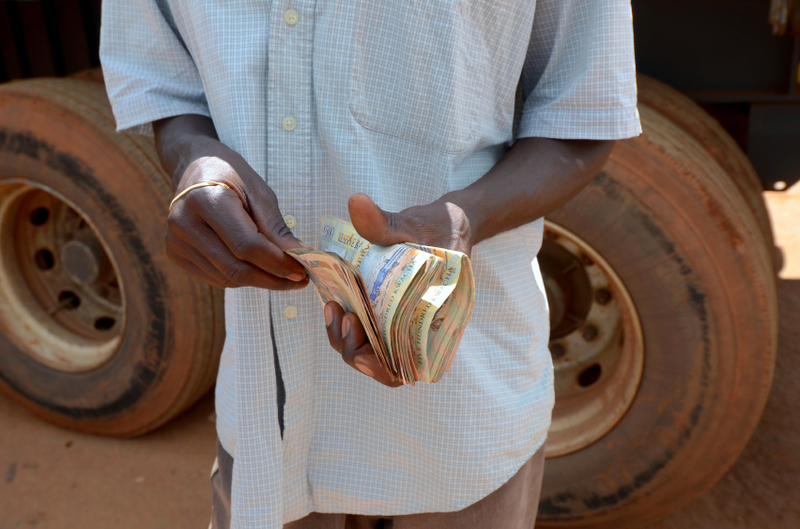 Given the vital importance of remittances globally, the question remains: how can money transfer stakeholders safeguard society from money-laundering and the financing of terrorism, while keeping essential remittance channels open? This is what UK Government officials, money transfer industry associations, and members of civil society are currently trying to figure out. At the end of July, UK members of Parliament convened to discuss how the Government could address the concerns of remittance companies. Members of the Somali diaspora have also been particularly vocal in the discussion, bringing their stories to the media. Further, a letter signed by more than 100 researchers and aid workers states that closing the Barclays Dahabshiil account would cause a crisis for Somali families that rely on money transfers from abroad. According to Thorncroft, the UKMTA is meeting with government officials, banks and other stakeholders to try to find a viable solution. One proposed idea is to establish a code of conduct for money transfer companies which would create an auditable set of standards for mitigating AML/CFT threats. With the Barclays decision primarily targeting small-scale, local money transfer firms, industry heavyweights such as Western Union and MoneyGram have seemingly escaped unscathed (even though they are responsible for a large share of regulatory fines, according to Thorncroft). Thus, in some contexts, diasporans may be able to use these services as an alternative. However, using these platforms are often not a viable alternative, as they charge far higher fees than local firms such as Dahabshiil. A simple comparison of sending GBP 50 from the UK to Somaliland showed that Western Union fees (GBP 4.90) were nearly two times those of Dahabshiil (GBP 2.50). Cutting off formal remittance channels, therefore, may result in individuals seeking underground, unregulated alternatives. This in turn could foster more money laundering, more terrorist financing, and more crime, according to Thorncroft. UKMTA has estimated that as much as 50 percent of existing cash-transfer business will divert to unregulated money transfer providers, where supervision is near impossible. With a gap now emerging in the remittance market, perhaps an innovative solution will arise to fill it. In a recent blog post on the Barclays decision, co-founder of Project Diaspora and Hive Colab Teddy Ruge asked, “is this an opportunity Africa’s mobile money revolution can exploit to fill the gap?” According to Mike Laven, CEO of Currency Cloud, innovative “pay out” solutions such as mobile money could make remittances more transparent, assuring regulators that they are reaching the proper destination. But, as Ruge asserts, “migrants can only send money home if the regulatory environment in their host country allows it.” In practice, this may also prevent any international mobile money transfer platforms from being able to take off. One solution, according to Laven, might be for money transfer firms to engage with intermediaries, who can conduct due diligence on smaller firms – cutting down on AML and terrorist financing risks. Perhaps Bitcoin, the decentralized, digital currency that we wrote about here, could provide a solution. Kipochi, a Nairobi-based startup, offers a Bitcoin wallet that enables users to easily send and receive funds via the Bitcoin network. According to co-founder Pelle Braendgaard in a recent interview, “we want to be the primary way to access Bitcoin for users in the developing world.” He said that he expects early adopters of the wallet to include Africans and members of the diaspora who seek an affordable and safe way to send and receive remittances. Unlike traditional money transfer firms, leveraging Bitcoin networks enables Kipochi to avoid AML or other regulatory risks, as the risk liability falls on the third-party Bitcoin exchange. This means that Kipochi can operate even in high-risk areas such as Somalia, where many other companies either cannot or do not want to offer services. While pressure from US regulators and international banks may be formidable, perhaps new players such as Kipochi can break through the stalemate and offer a product that can keep remittance channels open, while maintaining necessary checks against money laundering and other threats. With many livelihoods dependent on these remittances, it is essential that a solution be found, and soon.